To simplify that statement, the AMP Project is Google’s way of facilitating the creation of really fast-loading mobile pages, ones pared down to the bare minimum for maximum speed of delivery. The need for this is fueled by the fact that mobile users have surpassed desktop users at a time when multiple types of media are slowing down websites. Plus, content management systems—which are slow by nature—have taken over the web, which isn’t conducive to efficient mobile browsing. Now that U.S. consumers are spending an average of five hours per day on mobile devices, solutions clearly needed to be devised. Thus, the AMP Project. No matter where the concept of fast-loading times existed on Google’s list of priorities in May 2015, competition from Facebook surely caused this project to become more urgent. AMP launched on February 24, 2016 and, since that time, literally billions of AMP pages have been published. An average AMP page boasts a speed increase of about 400% over a typical mobile page—and, yet, it needs ten times less bandwidth to load. As digital media giants race to facilitate lightning fast online content consumption, we feel compelled to refer to the now-ubiquitous Microsoft Corp study that, in 2015, shared how the average human attention span had dropped to below that of a goldfish. This cold-water fish, commonly found in aquariums, registers an attention span of nine seconds, whereas the human span had dropped to an average of eight, “highlighting the effects of an increasingly digitalized lifestyle on the brain.” Looking back to when the mobile revolution occurred (in 2000), human attention span was about 12 seconds, so it had dropped by one third in 15 short years. Thus, the AMP Project. How Does AMP Work – and Is It Really Working? As for the number of AMP documents: in September 2016, there were 600 million. As of May 18, 2017? Two billion! As of October 19, 2017? FOUR billion from more than 25 million different domains. At this point in time, more than 400 people have contributed to this open source code. Taking a closer look at AMP HTML, you can find more specifics on how to create this type of page from the AMP Project site. To ensure that you can take advantage of all AMP features to their fullest, you need to use HTTPS protocol (rather than HTTP). 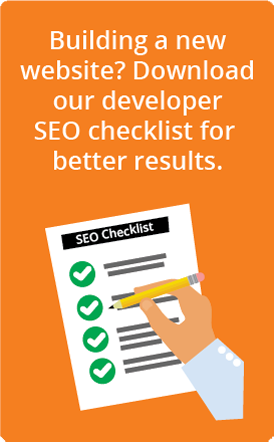 You can find even more information about creating an AMP page and relevant structured data at Developers.Google.com. Like any new development, there are positives and negatives. Looking first at the up side of AMP, we agree: pages are fast. Really fast. From an SEO perspective, there does seem to be a ranking boost for AMP-validated pages on mobile phones, especially when connected to news stories (more about rankings later). Then there is the mobile first index. This concept was announced by Google on November 4, 2016, and was originally projected to become a reality some time in 2017. It is now projected to roll out in 2018. When the index finally does become a reality, it will be a time of significant change for websites, their rankings, and for the SEOs and webmasters who manage those sites. In June 2017 at SMX Advanced, Google webmaster trends analyst Gary Illyes said the mobile first index debut was “probably many quarters away,” adding that Google plans to be very proactive about communicating with webmasters about this index. Stay tuned! Finally, in the good news category: because AMP uses open source protocol, it is continuing to be updated, and updates are likely to have a net positive effect. Although AMP is achieving its goal for speed, how readily will the average webmaster participate? These pages have only been included in organic search results for a little more than a year (since September 20, 2016), so all is still unfolding. As mentioned, AMP pages require validation, so you’ll need to monitor your Google Search Console for validation problems. If you have validation issues, you will need to head to the AMP Project validator tool where you must enter the AMP URL (with “param hs_amp=true”) to receive more information about what the validation problem is. Typically, there are HMTL issues within the content itself that need to be addressed. As a subset of “The Bad,” AMP pages are also ugly—as in, really ugly. By stripping down the HTML, the styling of these pages and the webmaster’s ability to incorporate branding into the pages have gone back in time. Yes, we know that nostalgia is in, with people buying retro cell phones and the like but: no branding + simple styles = UGLY. Note that increasing numbers of templates are being created for AMP. So, again, stay tuned. If you’re ready to implement AMP, how you do so depends upon your site. If you have a custom website, you pretty much need to hire a developer. If you have a content management system, you can carefully read all your documentation and install the AMP plugins yourself. Or, you can hire a developer. No matter what you decide, it’s crucial that you validate your pages and create a separate AMP sitemap to speed up indexing. If you’ve got a WordPress site, you can find plenty of information and options for AMP with pages and posts at AmpForWP.com. Extensions are required for full functionality and options are pricey with support likely to be sketchy. WordPress.org offers a simple and free plugin, but AMP is supported for posts only (not pages). The Yoast Glue plugin is also needed for the AMP plugin to work well—and, even then, the setup is buggy. Google has said, repeatedly, that AMP in and of itself is not a ranking signal. Here is where John Mueller said so on January 25, 2017. However, in the video found on that page, Mueller states that, if the AMP pages are your primary (canonical) version, then these are the pages that Google will judge when making ranking decisions. And, since site speed has been a ranking factor for several years, the speed of pages that are successfully AMP-ed will play a role in ranking. Plus, when your site has faster-loading pages, this affects the user experience, which is likely to continue to play an increasingly larger role in organic SEO rankings. Furthermore, at least for now, AMP pages are seen on the news carousel, found above-the-fold and pushing down standard organic results. Pages in the carousel are therefore naturally going to receive more impressions and clicks, with a lower bounce rate as the more impatient searchers receive more instant gratification. AMP pages making the carousel will benefit even further with clicks when a compelling image and headline are included. And, assuming that your content is what searchers want and need, this should boost dwell time and then conversion rates (even AMP won’t help, of course, if your content isn’t what consumers want to consume!). AMP’s potential impact widened in another way when, at the March 2017 AMP Conference, Google announced that this technology will be available over additional search engines, including Baidu, Sogou, and Yahoo Japan. Two months later, on May 23, 107, Google shared that AMP was now available via AdWords in display and search ads alike. In May 2017, Google began beta testing the concept of sending PPC traffic to AMP landing pages. In September, it was anticipated that all advertisers using search text ads would have the ability to direct mobile search ads to AMP landing pages. Initially, caching would only be available through Chrome on Android devices, although more widespread options and support is said to be in the works. Developer resources for AdWords can be found here. A significant percentage of companies are clearly prioritizing AMP, given that there are now four billion pages using AMP. But, the fact that the mobile first index is still scheduled for “someday” rather than for a specific upcoming date probably means that numerous other companies are pushing this line item down on their priority lists—and may continue to do so until the consequences that will occur with a mobile-first search engine index loom. That’s the role that human nature plays in adopting any new technology, and it’s no different with AMP. Google’s own sense of urgency may ramp up if competition from other fast-loading content systems (such as Facebook Instant Articles) becomes more significant.